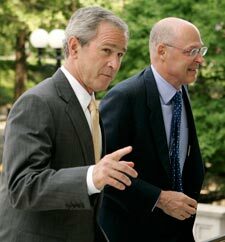 Sean Brodrick writes:Last week, President Bush and Treasury Secretary Paulson rolled out their mortgage bailout plan. And most investors have heard enough to know they don't like it. #1. Moral hazard is gone. This plan rewards speculation of the worst kind. Investors and homeowners alike have learned that the government will provide golden parachutes if they take the most reckless, irresponsible course imaginable. #2. This is not a plan designed to help homeowners. The plan is only for those with loan-to-value (LTV) of 97% or higher. In short, it's a scheme to get people to keep making mortgage payments on a loan that is worth more than the collateral, when their smarter option might be to walk away. So this is a plan to rescue the most irresponsible of lenders! #3. The plan is too small to be effective. President Bush emphasized that the plan could help as many as 1.2 million subprime borrowers — about two-thirds of all people with subprime loans. The fact is many stressed homeowners are actually EXCLUDED from the plan. According to The Center for Responsible Lending, a nonprofit group that supports homeownership, the freeze would only help about 145,000 people! There IS a Silver Lining, One That Could Pay Off Big-Time For Smart Commodity Investors! The market isn't happy with Bush and Paulson's plan, but commodity investors should be. Yesterday's Fed rate cut was the third one this year — for a total of 100 basis points (one full percentage point) — and I think there's a lot more where that came from. Reason: The mortgage bailout will enhance the effect of ongoing interest rate cuts. See, President Bush's plan is voluntary — the only way it will work is if mortgage lenders go along with it. And the only way they'll freeze teaser rates on adjustable-rate mortgages is if Fed Chairman Bernanke gives them a wink-and-a-nod that he's not going to raise interest rates — and in fact, may cut them even more. Last Thursday, Bernanke said the plan was a "welcome step," and that looks like a signal to big lenders that even if inflation heats up, the Fed is going to keep interest rates low. Bernanke has the perfect cover to do this — the Fed can justify further rate cuts as a way to stave off a potential economic slowdown. After all, most economists on Wall Street now think the U.S. economy is heading into a recession next year. The Dollar Will Fall ... Inflation Will Soar ... And Commodity Prices Will Go Higher! U.S. rate cuts boost commodity prices, plain and simple. That's because, as I've told you in previous columns, precious metals and the U.S. dollar are on a "see-saw of pain" — as one goes up, the other usually goes down. And when Bernanke follows through with more rate cuts, the dollar's yield falls relative to other major currencies. Combined with a slowing U.S. economy, that could be enough to send the greenback on its next big leg down. As you can see from my chart, the U.S. dollar has recovered off its worst levels in recent weeks, leading some investors to believe the worst is over. But if the Fed keeps cutting rates — and I think I've laid out a good case here for why it will — that could send the greenback sliding anew. At the same time, the combination of cheaper money and rising inflation are likely to send even more cash into investments like precious metals. Add it all up and we've got a commodity outlook that is explosive. If the prices of oil, gold, silver, wheat and other commodities seem high now, just wait. I think they're going to get a lot higher! If you're tired of subpar returns with the "Dogs of the Dow" and want to start actively participating in the commodities bull market, you can consider a broad-based exchange-traded fund like the PowerShares DB Commodity Index Tracking Fund (DBC) . It's a long name for a simple idea — the fund invests in commodities such as crude oil, heating oil, aluminum, gold, corn and wheat. It's up about 26% so far this year. Of course, if you want to go for even bigger gains, I like the potential of individual stocks. While single equities carry more risk, there is the potential for tremendous reward. One I like right now is Silver Wheaton (SLW) . The company is well positioned to benefit from all the forces I just told you about: A falling dollar, commodity inflation, and more liquidity in the markets. This company gets 100% of its revenue from silver. It purchases silver from operating mines at a set rate, insulating it from rising costs. Its production should come in at 13 million ounces in 2007 and rise to 25 million ounces by 2010. Finally, Silver Wheaton has 362.2 million ounces in proven and probable silver reserves. The stock isn't cheap, but it is outperforming both gold and silver. I recommended this stock to my Red-Hot Resources subscribers last Friday, and that position was solidly in the black at the end of trading on Monday! See, there really is a silver lining to the subprime bailout after all! P.S. The markets are volatile right now. So it's just as important to know when to get OUT of a position and book profits. To get all my buy and sell targets on Silver Wheaton and other lucrative commodity plays, click here now to start your risk-free introductory subscription to Red-Hot Resources .